Today a major account sales force not only must sell a competitive advantage, they must be a competitive advantage – and that requires the ability to think and act strategically. The Sales Momentum white paper - Getting Major Account Sales Strategy Right - highlights 15 best practices for formulating and executing business development sales strategies in major accounts. Unlike many general white papers on sales strategy, this one focuses just on major accounts. It highlights specific business development best practices that work in major accounts. Major accounts are not just big little accounts; they are quantitatively different. So top performers selling to major accounts cannot continue doing “faster” or “better” what they did when selling to smaller accounts. Successful major account salespeople sell differently – starting with crafting sales strategy. “Unlike many general white papers on sales strategy, this one focuses just on major accounts. It highlights specific business development best practices that work in major accounts," says Dr. Richard Ruff, co-founder of Sales Momentum. Major account salespeople must be business-savvy sales consultants who have developed superior sales skills, have a comprehensive knowledge of their customer's business and the knowledge and political acumen to leverage and orchestrate internal company resources – to both develop new business and grow existing accounts. Recognize that the future doesn’t necessarily look like the past - changes driven by global marketplaces make the past a bad predictor of the future. Network – know who is playing which role, the relationship between the players, and what they think about you and your competition. Leverage institutional resources – major account selling is a team sport. Document good news since it doesn’t document itself – make sure everyone in the buying process knows the good news story. Bad news, unfortunately, documents itself! Broaden the definition of competition – competitors include everyone competing for the same budget dollars – not just direct competitors. Make the business case – it’s unlikely a major account sale will be closed without making a strong business case to prove the business need to invest in the solution. “Although there is a high variability across companies, the percentage of major account revenue can range anywhere from 30% to 50%. This means that major accounts have a disproportionate impact on the revenue of a company. So, getting major account sales strategy right matters,” says Dr. Janet Spirer, co-founder of Sales Momentum. The free white paper Getting Sales Strategy Right is available as a pdf file. Sales Momentum regularly publishes ebooks, white papers and blogs on major account selling, sales effectiveness, sales coaching, and sales training. 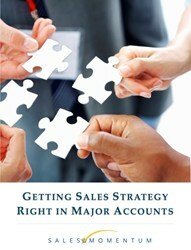 A companion to this white paper is an ebook and smartphone app: Mastering Major Account Selling. About Sales Momentum: For more than 30 years Dr. Richard Ruff and Dr. Janet Spirer – the founders of Sales Momentum – have worked with the Fortune 1000 to design and develop sales training programs that make a difference. By working with companies – such as UPS, Smith & Nephew, Textron, the Center for Creative Leadership, and Robbins & Myers – they have learned that today’s standard for a great sales force significantly differs from yesterday’s picture. Janet and Richard co-authored Mastering Major Account Selling and Parlez-Vous Business. They also publish the sales blog - Sales Training Connection. Richard co-authored with Neil Rackham Managing Major Account Selling and Getting Partnering Right. The books are available here.